Earlier this year, I read a short story from Ms. Rossiter, Christmas on Capecod. Here I was introduced to Asa Coleman, his son Noah and Maddie, his best friend. When I finished, I secretly yearned to read more about the Coleman family, but never spoke the wish out loud. 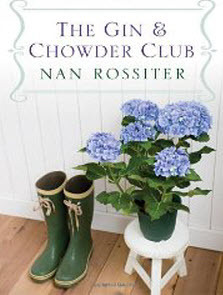 I was pleasantly surprised when Ms. Rossiter contacted me directly to thank me for the review and asked if I would like to read another story of hers, The Gin & Chowder Club, a prequel to the story I had just read and reviewed. Needless to say, I said "Yes! "; and I must tell you, I was not disappointed. Prequels are a whole other style of book to read because you have already been introduced to characters that you feel close to, but at a time much later than the prequel you're about to read. With this in mind, I had to forget about what I had already read, let go of any preconceived notions, and open myself up to a world of possibilities. The Gin & Chowder Club shares the story of two families and their friendship during a summer on Cape Cod. What I was not expecting was the story of young Asa, on the verge of college, falling in love with Noelle, the wife of his father's best friend. Noelle is not a "Mrs. Robinson", as she is much younger than her husband. However, she is a bit older than Asa. Despite this, Noelle and Asa find themselves drawn to each other; so much so that they can't help but to complete their connection towards one another. I understood their longing, and the qualms about acting upon their feelings. But then I had to read in angst and feel my heart sink in despair as I watched each deal with the aftermath of their actions. When Asa went away to college, I had hoped he would wake up to the error of his mistake, but then stopped myself and realized that I should not expect any less of him as he continued to act upon his feelings for Noelle. He was young and this was his first real experience of love. Should I expect the typical happily ever after? No, that would be foolish of me and totally destroy the purpose of the entire story. As it is, who would have ever expected the events that were about to unfold. Sure not I, the clever reader. Normally at this point, I probably would have put the book down and walked away because of the intensity of emotions leaping across the pages. However, I was compelled to finish. I just had to know how the author was going to connect this story to the one I had read earlier. Without giving away any more of the story, I will tell you now that you need to read this...probably with a box of tissue nearby. The Gin & Chowder Club, is a love story, but shows so much more than the sweet side of love. I learned more about Asa Coleman than I had ever expected. The events of that summer and the subsequent year at college, show me how he became the man as seen in Christmas at Cape Cod. Nan Rossiter wrote this story with such care and tenderness, you can't help but feel every emotion shared by Asa and Noelle. If there is anything that I can say then it is this...you will not be sad when you reach the last page of the book. Because in the end, Noelle will have given Asa the greatest gift she could have ever give him.